In this post, we'll talk about which parts of flowers are edible (such as edible petals), nutrition value, how they taste and how to use them. 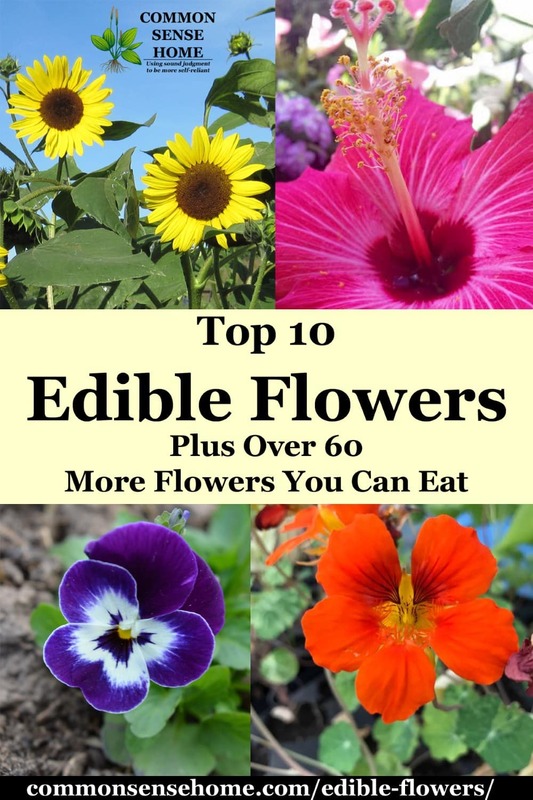 The top ten list of edible flowers includes those flowers that are most commonly used and easily identified. 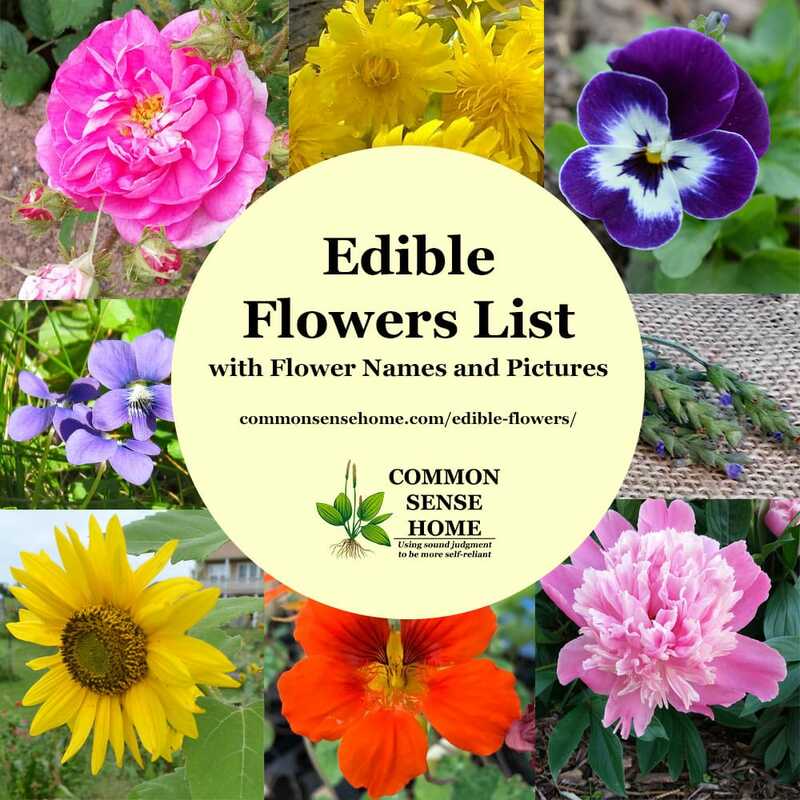 For the adventurous eaters, we've also added an edible flower list featuring the names (common and scientific) of over 60 more flowers you can eat. Edible flowers such as roses can be used fresh or dried. Whether you're nibbling edible petals or cooking up buds, flowers you can eat add fun to any table. They are eye catching, nutritious and delicious. Some restaurants use edible flowers in place of parsley as garnish and they are sold in the produce isle. We also use flowers for essential oils, medicines, dyes, art, decoration, beneficial insects and skincare. Not every flower is safe to eat. Make sure you have a positive ID of an edible flower before sampling. Try a small edible flower sample before eating a larger quantity. Although rare, allergic reactions are possible. Strongly flavored edible herb flowers are best used sparingly. Where can I buy edible flowers, edible flower petals or edible rose petals? Here are our top 10 edible flowers, in no particular order. Enjoy! Sunflowers are great for wild birds and your chicken flock, but they also make good people food, too. Try them on the counter top as microgreens, or add them to your garden for height and visual interest. 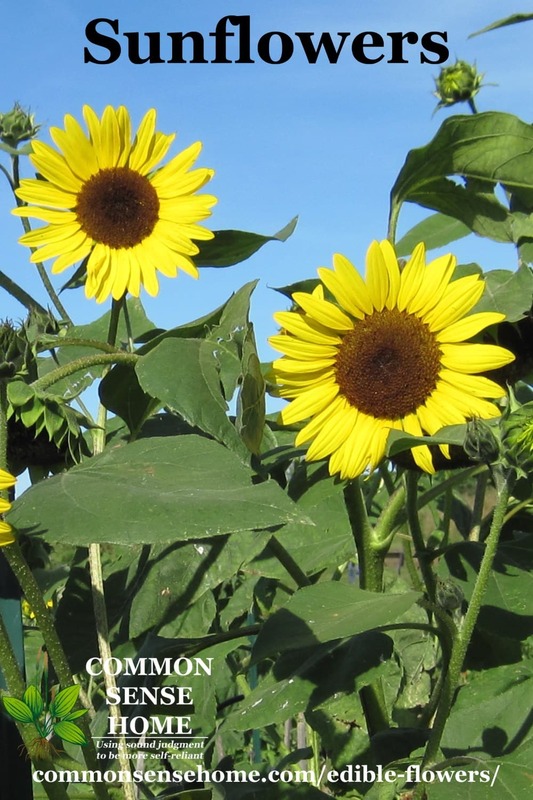 There are many different varieties of sunflowers, with different colors and sizes. Look for those that say “oil seed sunflower” if you're most interested in the seeds, and shorter varieties with lots of flowers if you prefer the buds. Edible Parts: Leaves, Roots, Petals and Seeds. Flavor: When the sunflower is in the bud stage, it tastes similar to artichokes. Once the flower opens, the petal flavor is slightly bitter. Seeds: Sunflower seeds are a healthy source of fats, protein and fiber. Eat them straight or in seed butter, homemade granola, cereals, sprinkled on salads and more. Sprouts: Eat sunflower sprouts as a micro-green when they are 1-2″ tall. Toss them in a salad, add to a top of a sandwich, or placed on a grilled piece of fish. Petals: Sunflower petals add amazing color, but can be a tad bitter. Use them sparingly in cooking. 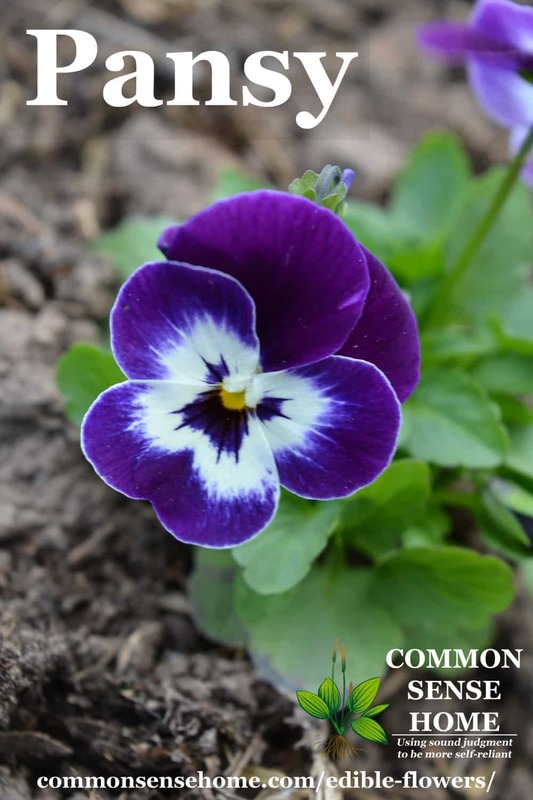 Violets add a bright flash of color to shaded areas of the yard. Their delicate fragrance perfumes the air, and their tender greens make an interesting addition to salads. Nutrition: Violets contain Vitamin C, Vitamin A, Iron, and Calcium. Flavor: The flowers have a sweet, perfumed flavor. Leaves are bright and grassy. Greens: Use violet leaves fresh in salads or cooked like spinach. Flowers: Use violet flowers fresh to preserve their lovely color and aroma. They can also be made into jellies or candied. Sugared violets make a lovely garnish on top of cakes, muffins or pastries. 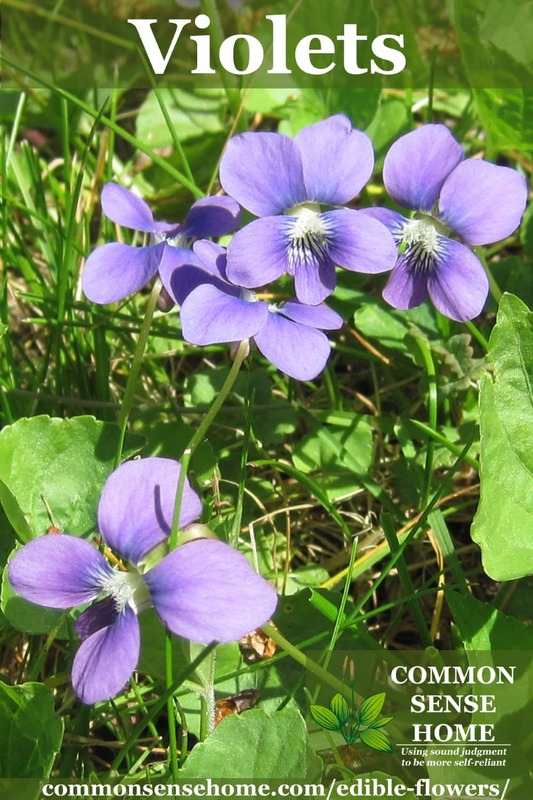 Get more information on violets and the recipe for violet jelly in Weekly Weeder #23. Love them or hate them, most people can easily identify dandelions. They have a rich history of use for both food and medicine. Their abundant blossoms are a precious food source for pollinators in spring when other food options are limited. When harvesting dandelions, make sure the area has not been treated with herbicides for at least three years. Edible Parts: Leaves, Seeds, Flower and Root. Flavor: Greens are earthy, nutty and pleasingly bitter. Roots are earthy with rich undertones. The flowers are sweet and crunchy. Dandelion seeds are mildly nutty with a hint of bitterness. Seeds: Although tough to gather in quantity, the seeds are edible. Nibble them straight out of the garden, or use them to make seed milk. Flower: Dandelion flowers brighten desserts, pastries, breads, wines, jellies and jams. Dipped in cornmeal and fried, the blossoms taste very similar to mushrooms. We have a recipe for homemade dandelion wine, and cake made with the leftover fruit from the wine on the site. Root: Dandelion roots are used in tea or roasted to make an herbal coffee substitute. 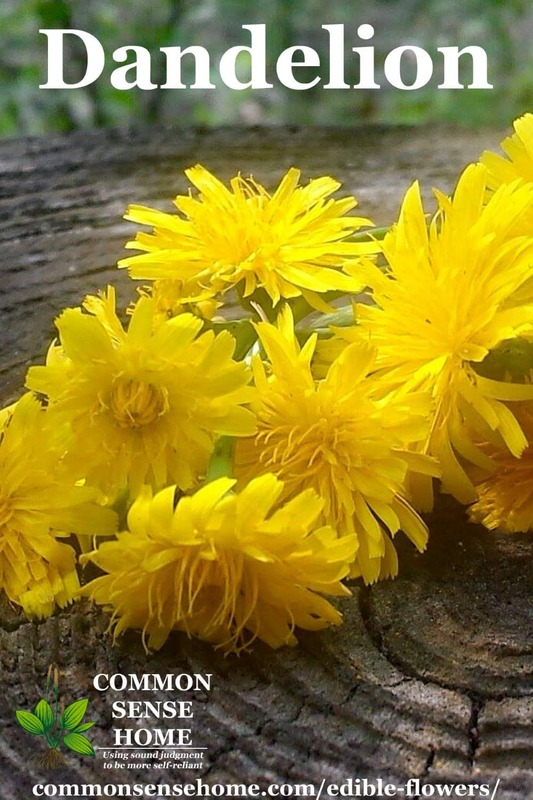 You can also use dandelions medicinally. 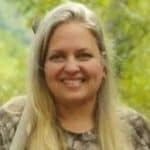 See Harvest and Using Dandelion Roots and Weekly Weeder #17 – Common Dandelion for more information. A rose by any other name would still be as sweet. Look for heirloom roses for the best fragrance and flavor. Many of the modern hybrids focus on looks only. Edible Parts: Rose Petals and Rose Hips. Nutrition: Rose hips are one of the richest plant sources of vitamin C. Rose hips contain the Carotenoids Beta-Carotene, Lutein, Zeaxanthin and Lycopene. Rose petals also contain vitamin C at lower amounts. 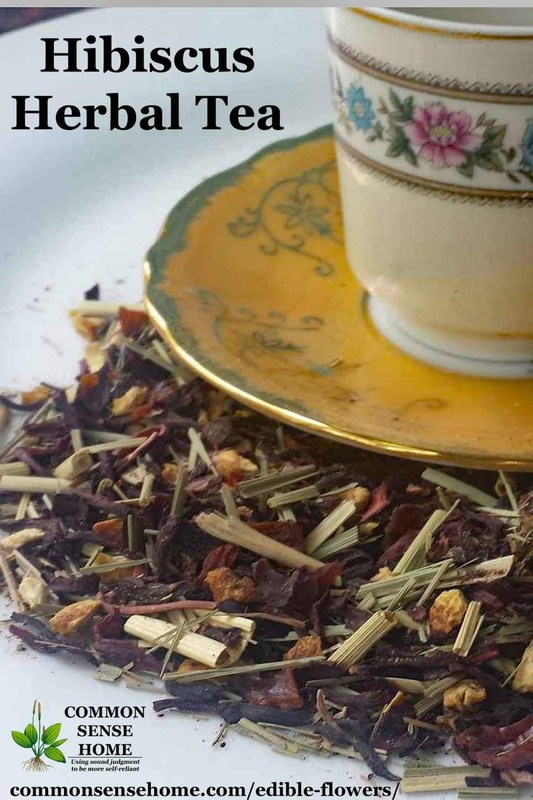 Flavor: Roses taste sweet, with subtle undertones ranging from fruit to mint to spice. If a rose smells good, it will have a good flavor. If the rose does not have a scent, it will taste like nothing. Rose Hips: Use rose hips to make jam, tea, or candy. Rose Petals: Use Rose Petals to make rose water or teas. Use them for color on salads and cakes. Hibiscus adds vibrant color to warm climate landscapes. If you don't have fresh available, use dried flowers to add a tropical twist to foods. Flavor: Cranberry-like flavor with citrus overtones. Use hibiscus in teas, soups, garnishes, water infusions or jelly. Hibiscus flowers may be stuffed like squash blossoms. Are pansies edible? You bet – and one of the most popular edible flowers. Pansies do best in cooler temps, so enjoy them in your garden in spring and fall. Flavor: Pansies have a slightly sweet green or grassy flavor. If you eat only the petals, the flavor is extremely mild. If you eat the whole flower, it tastes more green. Use edible pansies in soups, cocktails, desserts, salads or as a garnish. 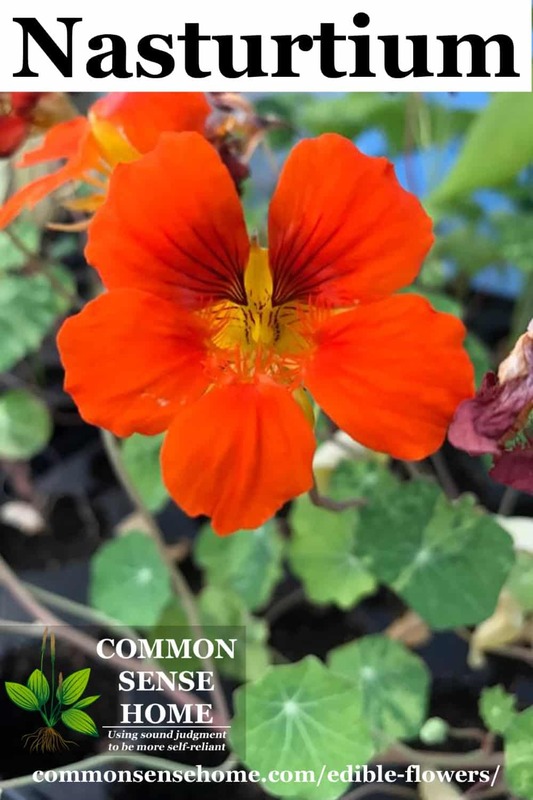 A healthy nasturtium plant can take over a garden bed, so give them plenty of room to ramble or look for dwarfing varieties that stay more compact. Nasturtiums also make good companion plants in the melon patch. Nutrition: Vitamin C, Iron, Phenols, Glucosinolates, Mustard Oil, Flavonoids, Carotenoids. Flavor: A sweet essence from the nectar, followed by a bold peppery tang. Leaves: Make a pesto with young leaves or toss in a salad. Buds: Use nasturtium buds in vinegar infusions, salads, cocktails. Pickled seed pods are less expensive substitute for capers. Flowers: Use entire flowers to garnish platters, salads, cheese toppings, open-faced sandwiches, and savory appetizers. Some day I'd like to visit the big fields of lavender, but for now I'm content with the lavender growing in my coastal garden. Lavender likes cool, moist winters and hot, dry summers. For more information about cultivation and lavender recipes, visit, “Lavender – How to Grow It and Use It for Food, Medicine and More“. Edible Parts: Leaves and Flowers. Stems can be used in cooking prep and flavoring. Nutrition: Vitamin A, Calcium, Phytochemicals, Limonene and Antioxidants. Flavor: Sweet, floral flavor, with lemon and citrus notes. Leaves: Finely mince lavender leaves and sprinkle on savory foods for flavor. Flowers: Try lavender flowers in desserts, jams, cocktails, drinks, breads, meat dishes, garnishes, cheeses. Stems: The stems of sturdy lavender varieties make great kebab skewers for grilling. This is a wonderful refreshing adult beverage with floral tones. The beautiful lavender is sure to wow your guest. Fill a glass with ice. Pour the vodka, lemon juice and Lavender Syrup. Stir thoroughly. 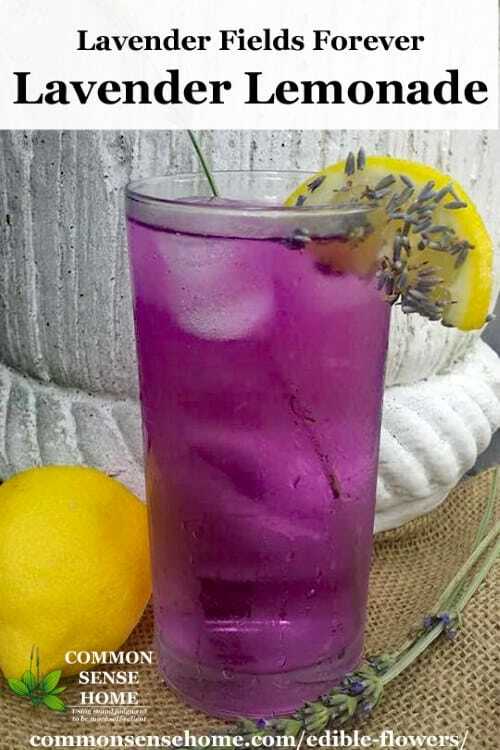 Roll the lemon slice in lavender and garnish glass. 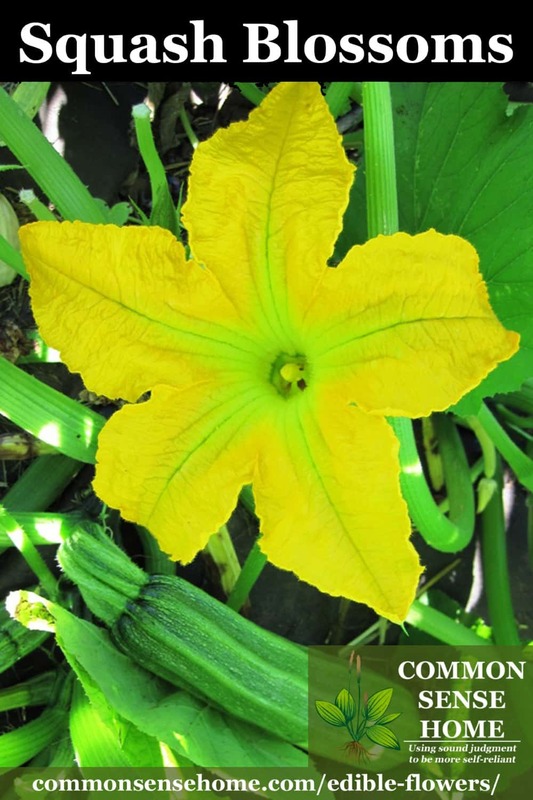 You can eat squash blossoms: fried, baked, stuffed, in soups, on salads, in pastas, and in casserole dishes. If your blossoms go crazy and you get overrun, check out “The Best Way to Use up Extra Zucchini” and “Summer Squash Gummy Candy“. Calendulas are also sometimes known as “English marigolds”, or “marigolds”, but should not be confused with French marigolds, Tagetes patula, which is also commonly called “marigold”. French marigolds are not edible. 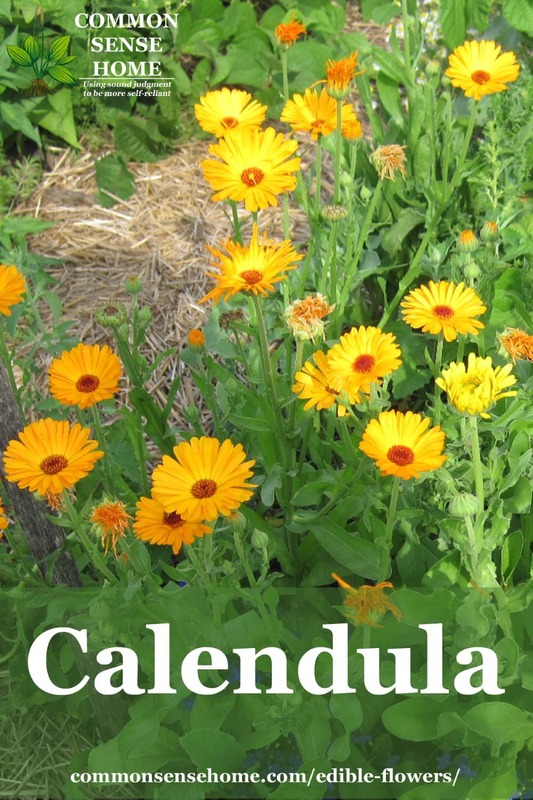 Calendula has a long history of medicinal use, treating everything from urinary tract infections to dry skin. For more on the medicinal uses of calendula, see, “Calendula Uses: Our 14 Favorite Recipes and Remedies“. Flavor: Light, citrus flavor. Flavors range from spicy to bitter, tangy to peppery. Calendulas are sometimes called “poor man's saffron”. Use calendula petals in cakes, pastries, salads, salad dressings, cocktails, custards, and sauces. The following edible flowers are featured in The Edible Flower Cookbook” by Adrienne Crowhurst. This book was published all the way back in 1973, so the copies in circulation are showing their age, but it's a gem. 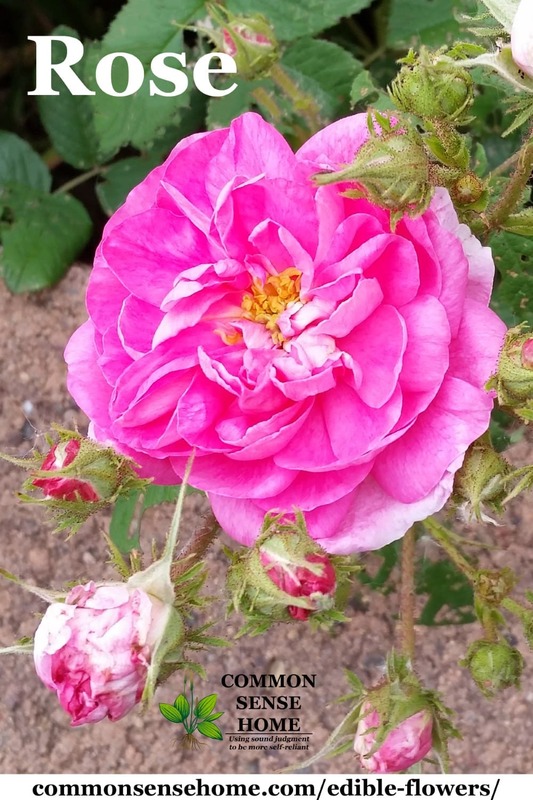 Flowers that are featured in the Weekly Weeder series are linked below. There are quite an assortment of newer cookbooks featuring edible flowers, which you can browse below. 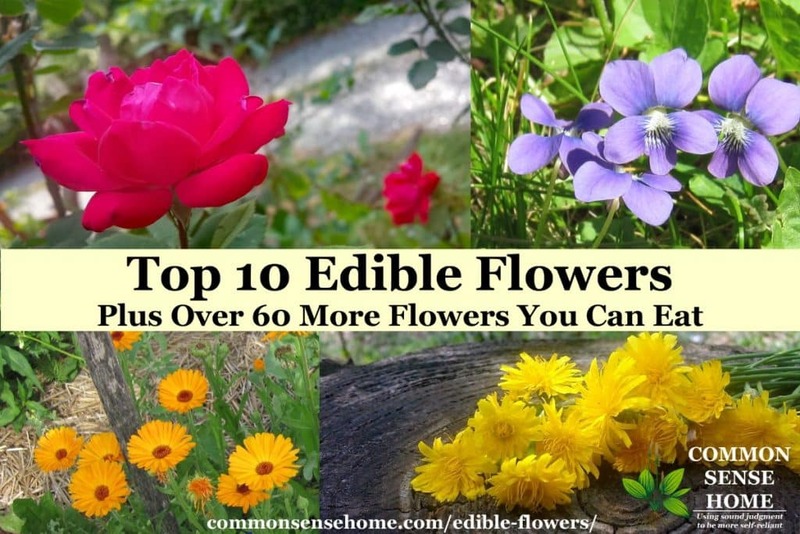 Have you tried Edible Flowers? Do you have a favorite recipe using edible flowers you'd like to share or questions about a specific edible flower? Leave a comment and let us know. As always, social media shares appreciated if you enjoy the post! Glad you enjoyed the post. Just make sure your neighbors don’t spray your snacks!